I worked at this charming neighborhood bagel shop all through high school where everything was made from scratch, and it was all delicious. I remember people lining up for the strawberry rhubarb pie so one day I decided to try it and see what all the fuss was about. It was perfectly sweet with a flair of tartness. The filling was a gorgeous shade of pink, and it reminded me of Spring. Over the past few years I’ve experimented with rhubarb in different desserts. I’ve made pies, crisps, muffins, ice cream, and sorbet. I got a beautiful bunch of rhubarb at the market last week and I wanted to make something a little different this time. I’ve never used chocolate with rhubarb so I decided to run with the idea and make some sort of miniature chocolate strawberry rhubarb tart. As I started making my strawberry rhubarb compote I realized I had to make them heart shaped, and I had to call them hot pockets! The end result of my experiment was amazing! With the addition of half a vanilla bean and the zest of an orange, the strawberry rhubarb compote itself is divine. The chocolate tart dough is buttery, and the valrhona cocoa powder adds a real depth of flavor to it. The fun strawberry rhubarb compote paired with the rich chocolate tart dough is just the perfect combination. It tastes like a party in your mouth! Lower heat and simmer about 10-15 minutes till rhubarb is tender and compote starts to thicken. Combine flour, cocoa powder, sugar, and salt in food processor. Add cubed butter and pulse till mixture resembles coarse meal. Add yolks, cream, and vanilla and pulse just until dough comes together. Turn dough out on a work surface and shape into a disc. Wrap in plastic and refrigerate until ready to use, at least an hour. Roll out tart dough on lightly floured surface. 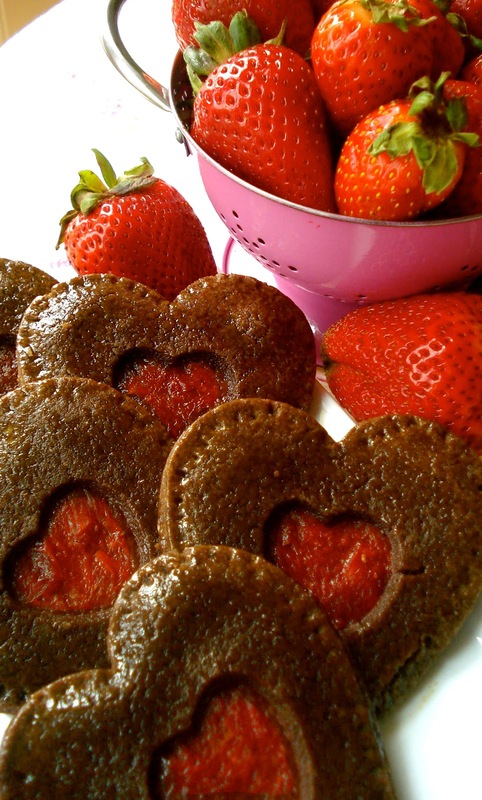 Cut out hearts using a 3″ heart cookie cutter. You will get approximately 24 hearts. 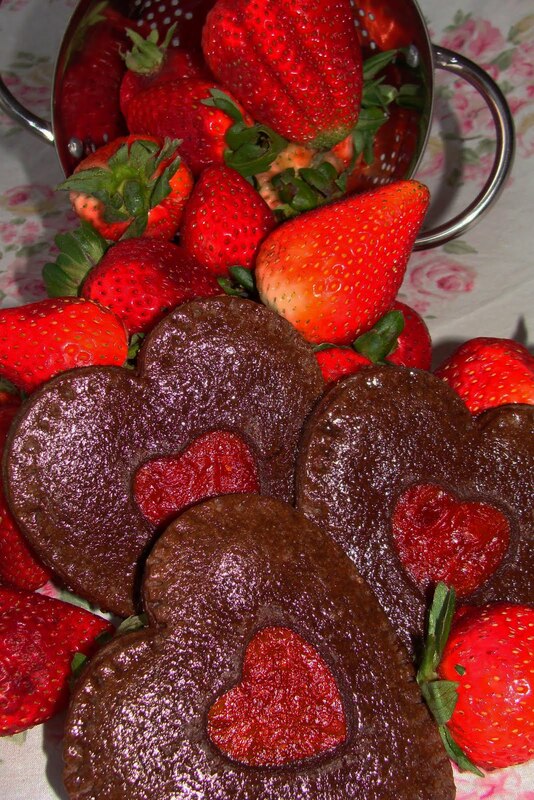 Take half of the hearts and using a 1″ heart cookie cutter, cut out the centers. These will be the tops of the hot pockets. Place bottom hearts on a sheet pan and brush with a beaten egg. Spoon 1T. of compote on each heart. Place top heart over compote and press ends together gently. The egg will help them stick together. Stamp the edge of a fork all around the hot pocket to seal them. Chill the hot pockets for 1 hour before baking. These hot pockets are perfect for brunch! If I was going to serve them at a dinner party, I would serve them with mascarpone gelato. For a quick and easy dessert just make the compote and serve warm over ice cream. You can freeze these hot pockets for up to a month pre-baked. >Yum! I love the strawberry rhubarb combo & it must be delicious in that chocolate dough! >These are beautiful! The chocolate/strawberry/rhubarb combo sounds delicious too! What a great idea! >These are absolutely adorable and look very tasty too! >Just gorgeous! And the filling of strawberry and rhubarb sounds incredible….mmmmmmm. >I've never had chocolate with rhubarb either. What a great idea! They look so delicious and cute! >I've been promising someone rhubarb compote for the past few weeks, so this is really helpful. And chocolate in rhubarb? Who'da thunk? >Those are just too pretty!! I love the filling… strawberries and rhubarb are such a yummy combo. >I love Rhubarb! These look amazing!!!! >These are so cute! The filling sounds delicious! >Oh well these are just lovely! I can't get enough rhubarb right now! >They are so pretty! I love rhubarb and have LOTS of it in my garden right now. Rhubarb and strawberries are such a great combo but I can't say I have ever tried rhubarb with chocolate! >Ohh what a pretty hot pockets..wonderful flavor combination and presentation is amazing! Thanks for sharing this mouthwatering recipe! >Wow these look fabulous, and I love the heart shape — so fun! >Cutest little pockets ever! What a great look for this treat. I'm trying to imagine having some leftover to freeze…but I'm doubting it would happen. 😉 Wonderful recipe. >These are soo cute! I love the strawberry rhubarb combo too! >These are adorable! I love that they're in the shape of little hearts too. lovely post. >If this isn't the cutest thing I've ever seen!! I ♥ it!!! >That chocolate dough looks like it would melt in your mouth. Must try rhubarb soon. Very pretty. >These are adorable! They look so pretty. I've heard a few people the past week say that they think rhubarb is too difficult to deal with, too tart. I was so surprised. Here on the west coast it's practically a weed this time of year and I've grown up adding it to all kinds of things. I'd love to try a chutney with it! >The pockets are so cute! I don't think I have ever had anything with rhubarb in it, at least not to my knowledge. I definitely will check out a farmer's market or whole foods and see what I can do with it! Thanks for the recipe! >Such a great idea. And it looks wonderful. >I am loving anything strawberry rhubarb this time of the year, but these are so creative! I love that you have shaped them into cute hearts as well, and have a peek of the filling on the top! Beautiful! >I have to start using rhubarb in my desserts. It's flying all over the blogosphere and I'm convinced that it's worth a try! >I don't believe I missed those. Yummy cookies!